A new crop of Oscar prospects crammed the red carpet at what is widely considered Tinseltown's award-season starting gate: the Hollywood Awards. 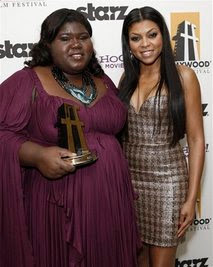 "I think I was extremely naive when I showed up here tonight," giggled New Hollywood Award winner Gabourey "Gabby" Sidibe, who plays the title role of an abused daughter in "Precious: Based on the Novel Push by Saffire." "This is a big thing," she said. Among the other honorees walking the media gauntlet Monday night: Hilary Swank ("Amelia"), Julianne Moore ("A Single Man"), Carey Mulligan ("An Education") and Christoph Waltz ("Inglorious Basterds"). Presenters included Sandra Bullock, Ewan McGregor, Kate Beckinsale, Morgan Freeman and "Juno" screenwriter Diablo Cody. "I first came to this show a couple years ago, and we won for 'Juno,'" Cody said. "I think this is kind of like the first. There's something in the air." "It's a great festival," commented Oscar-winner Charlize Theron, whose performance in "North Country" earned her the Hollywood Actress Award at the 2005 gala, and she went on to nab an Academy Award nomination that year. "It really does create a bit of noise." Theron dropped by to present a Hollywood Breakthrough Actor Award to her "North Country" co-star and friend Jeremy Renner, honored for his performance in "The Hurt Locker." "You know, he's been great in everything," Theron said. "But he really shines in this film. This is really his moment." While the festival is 13 years old, only over the last few years has its gala emerged as one of the award season's tentpoles. The fest's chairs, judges and advisers include film critics, film-industry executives and film-festival chiefs from all over the world — making for one enigmatic voting group. Christoph Waltz, the veteran German character actor who won the Hollywood Supporting Actor Award after stealing scenes from Brad Pitt as ruthless Col. Hans Landa in "Inglorious Basterds," admitted to not knowing who the voters are. He said it actually "helps me get through it in a sort of relaxed, organic way." For at least some of the attendees, this likely marked the first of four constant months on the award-show circuit. "Four months of this?" asked British actress Carey Mulligan, sounding surprised. Mulligan's portrayal of a young student in a relationship with an older man in "An Education" earned her the Hollywood Breakthrough Actress Award, and has some Oscar pundits saying it'll also lead her to the Kodak Theatre next March for the Academy Awards. "Oh, I just met Hilary Swank. I'm in a little bit of a daze," Mulligan continued. "This is exciting. The photo bit is a little scary. The lights flash a lot and they made my eyes water, which is terrifying. But it's amazing." Four-time Oscar nominee Julianne Moore, honored with the Hollywood Supporting Actress Award for a blast of films including designer-turned-director Tom Ford's "A Single Man," said balancing life, work and award shows does present its challenges. "Obviously, it's all a lot easier if you do live in Los Angeles," explained Moore, who lives in New York. "And the flying. I was just at the London Film Festival, so I came from the London Film Festival, right to here. So, that's kind of exhausting. And I am anxious to get home to my kids." "I have to say it's something very surreal," noted Swank, the two-time Oscar winner who won the Hollywood Actress Award for her work in "Amelia." "But to have your work recognized? At the end of it all is something that continues to leave me speechless."